So, I have something that maybe is a little embarrassing to admit. I have never made a cheesecake before. There- I said it! I mean really, of all the baking I have done over the past several years, you would think a proper cheesecake had been made somewhere in there. But no. Sure, I have made plenty of no-bake cheesecakes. But, in reality, those don't really count. Basically, the main reason I have never attempted a real cheesecake is, my husband hates cheesecake. Who hates cheesecake!? He doesn't like cream cheese, even though I have been trying, and only semi-succeeding, to convert him for years. So, there hasn't been a lot of motivation for me to go through the effort to make an entire cheesecake, only to be stuck eating the whole thing by myself. Wait, when I say it (write it?) out loud, that sounds like the best excuse to make a cheesecake! Ha. Oh well. So, I decided that for my first cheesecake, I had to make it epic. This cheesecake did not fail me. In fact, it was amazing. Like out of this world. It was creamy, sweet, perfectly spiced and just phenomenal. It's like a holiday party in your mouth. Even my husband, a determined cheesecake hater, actually liked it! I was very impressed. I am not usually a big cranberry fan, but the sugared cranberries with the cheesecake were a perfect fit. Also, the addition of the baked cranberry purée was the perfect combination. It brought the cheesecake to the next level. 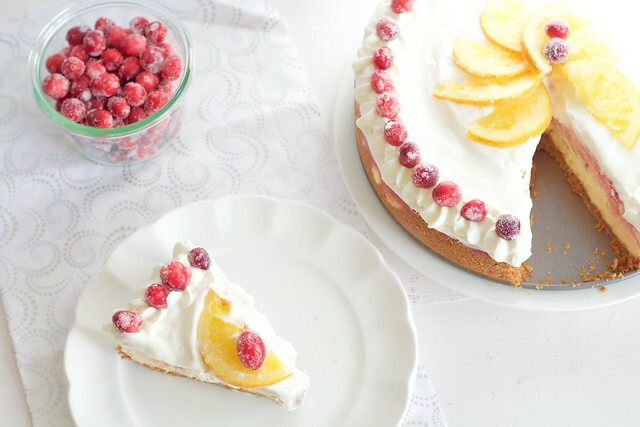 It also made it perfect to serve for a Thanksgiving or Christmas dessert! It's very festive! 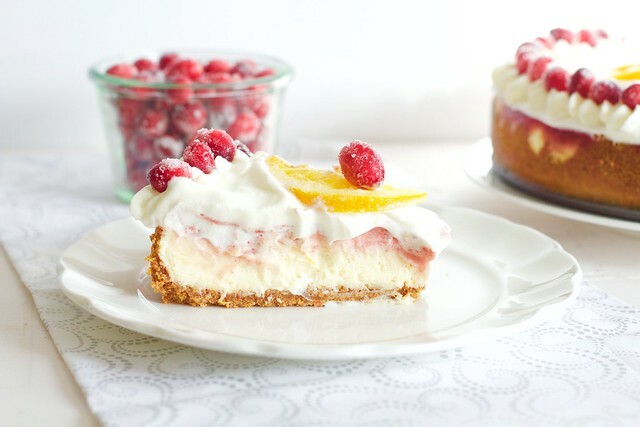 The even better thing about this cheesecake is, you can make it ahead of time! So, if you are planning on serving it for Thanksgiving dessert, it will be one less thing to deal with on the big day. The sugared cranberries and candied oranges can be made days ahead of time and stored in the refrigerator. The cheesecake gets baked, then has to sit in the refrigerator for the night before finishing with whipped cream and the fruit. That way, it looks and tastes as fresh as can be! 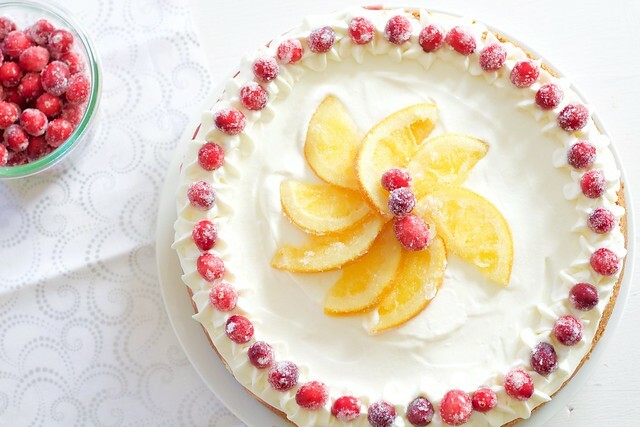 This is definitely a showstopper dessert that would make the crowd "ooo" and "aaahh". Place a springform pan on a double layer of heavy duty foil. Wrap the foil up around the outer sides of the pan and set aside. Have ready a large roasting pan that the springform pan will fit inside of comfortable. Also, fill a kettle or medium-size pot with water and bring to a simmer. Keep warm until ready to use for the water bath. To make the crust, combine the graham cracker crumbs, brown sugar and spices in a bowl and stir with a fork. Stir in the melted butter until completely incorporated. Pour into the springform pan. Press down with your fingers to flatten crust on the bottom of pan, and about 1-inch up the sides. Set aside. For the cheesecake, place the cream cheese and sugar in the bowl of a stand mixer. Beat on medium-high speed until light and creamy and fully incorporated. Beat in the eggs, one at a time. Mix in the vanilla extract and orange zest until combined. Beat in the sour cream until fully incorporated. Pour into the crust and spread into an even layer. Dot spoonfuls of the cranberry purée around the top of the cheesecake. With a butter knife, gently swirl the purée into the cheesecake. Place the pan into the roasting pan. Pour the hot water, very carefully, into the roasting pan, making sure not to get any in the cheesecake, until it reaches about half way up the cheesecake. Place in the oven and bake for about 1 hour and 15 minutes. To check doneness, very gently shake the roasting pan. If the cheesecake is slightly wiggly (like jello), then it is done. It should be slightly firm, but still wiggly. Turn the oven off and crack the door. Leave in the oven for 30 minutes. Then, remove from the oven and let cool completely Remove the cheesecake from the roasting pan and remove the tinfoil. Cover with plastic wrap and refrigerate overnight. 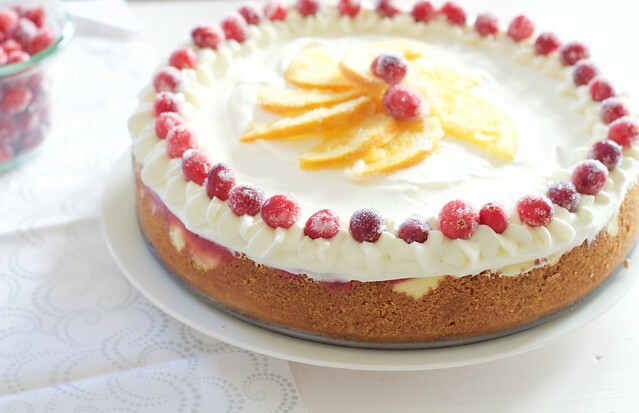 To finish the cheesecake, remove the sides of the springform pan and place the cheesecake on a serving platter or plate. Gently spread freshly whipped cream over the top and pipe around the edges, if desired. Garnish with sugared cranberries and candied oranges. Serve and enjoy!